Having designed an Apple iBooks Author ebook in-house, Exner were left with the prospect of having to jump through hoops to release these for sale on Apple. The team at Australian eBook Publisher are happy to help distribute ebooks even if they have not designed them. Please contact us for details about our Aggregation Only service. 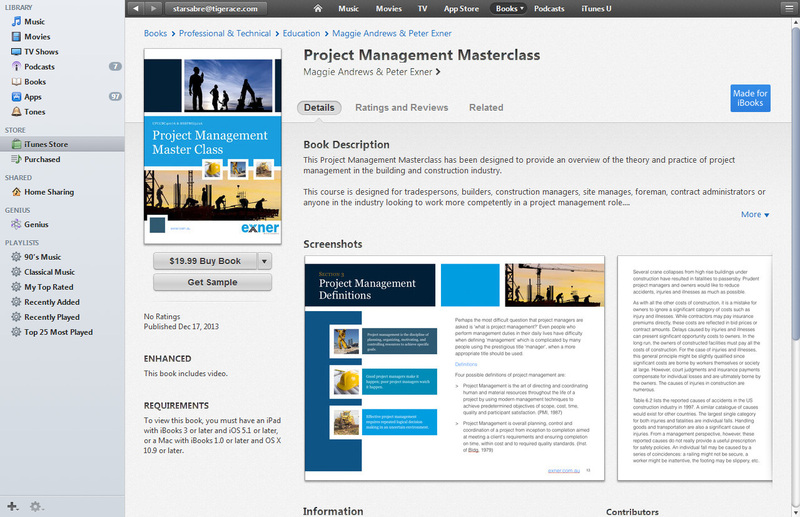 Below is how the book looks up for sale on Apple iBooks. Now that Apple Mavericks has been released (Feb 2014) it is easier than ever for people to use Apple iBooks multi-touch books. They can be read on iPads as well as on desktop Macs. 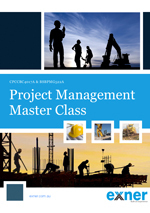 This Project Management Masterclass has been designed to provide an overview of the theory and practice of project management in the building and construction industry. This course is designed for tradespersons, builders, construction managers, site manages, foreman, contract administrators or anyone in the industry looking to work more competently in a project management role. The course is also useful for engineering or construction graduates who are looking to understand both the management and practical aspects of working on a construction project. 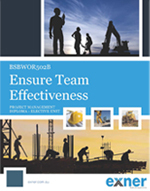 In guiding a project – particularly one in the building and construction industry - team effectiveness is critical to the successful delivery of the project. In reality, many people talk about team effectiveness in construction, but very few are really good at understanding and implementing team effectiveness. Whilst Team Effectiveness is not a new concept for teaching, Exner Education, drawing on their 25 years of experience in the construction industry have tailored this course to address many of the challenges (call them risks) facing Construction Projects and their Project Managers today. Facilitating continuous improvement is key to being a good operator and deliver projects in the building and construction industry. Continuous Improvement means taking lessons learnt and improving on your performance on an ongoing basis. Whilst on its own Exner Education’s Facilitate Continuous Improvement course serves to provide an understanding of the theory and practice of continuous improvement in the building and construction industry, the course also enables the student to attain a nationally accredited professional certificate in the unit of BSBMGT516C - Facilitate Continuous Improvement. 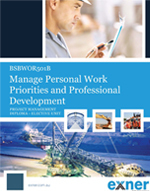 In guiding a project – particularly one in the building and construction industry - you really need to know how to manage work priorities. This is also true of you want to become a great project manager. In this course, Exner draw on their 25 years of experience in the construction industry have tailored this course to address many of the challenges facing Construction Projects and their Project Managers today. In guiding a project – particularly one in the building and construction industry - an intricate knowledge of Project Cost Management is critical in determining the project’s outcome. 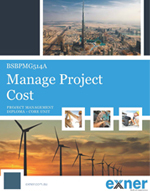 In reality, people practice many of the concepts involved in Project Cost Management however our course will allow students to fully utilise and benefit from such a detailed understanding of Project Management Diploma theory. Whilst on its own Exner Education’s Project Cost Management course serves to provide an understanding of the theory and practice of project management in the building and construction industry. In guiding a project – particularly one in the building and construction industry - an intricate knowledge of Project Human Resource Management is critical in determining the project’s outcome. In reality, people practice many of the concepts involved in Project Human Resource Management however our course will allow students to fully utilise and benefit from such a detailed understanding of Project Management Diploma theory. 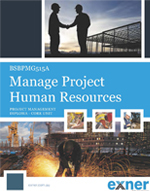 Whilst a Project Human Resource Management is not a new concept for teaching, Exner Education, drawing on their 25 years of experience in the construction industry have tailored this course to address many of the challenges facing Construction Projects and their Project Managers today. In guiding a project – particularly one in the building and construction industry - you really need to be a good communicator and understand systems of project communication. Typically, construction projects have the greatest risks associated with them and as such are far more susceptible to deliver outcomes where large financial losses are experienced or the project be delivered late or to a lower quality than expected. Good communication is vital. Whilst on its own Exner Education’s Manage Project Information and Communication course serves to provide an understanding of the theory and practice of good project communication, this course also enables the student to attain a nationally accredited professional certificate in the unit of BSBPMG516A - Manage Project Information and Communication. 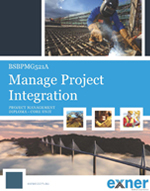 Manage Project Integration covers the skills required to successfully integrate key management aspects on construction projects. It brings together all the aspects of project management to ensure the construction project is well managed. 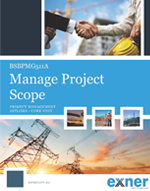 This course is designed in accordance with BSBPMG521A as part of a Nationally Accredited Training Package with the Australian Skills Qualification Authority and forms part of the full Diploma of Project Management Course BSB51413. Completion of this subject will count towards completion of the full diploma. 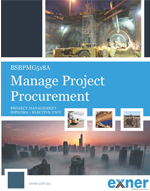 In guiding a project – particularly one in the building and construction industry - an intricate knowledge of Project Procurement Management is critical in determining the project’s outcome. 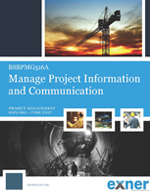 In reality, people practice many of the concepts involved in Project Procurement Management however our course will allow students to fully utilise and benefit from such a detailed understanding of Project Management Diploma theory. Whilst a Project Procurement Management is not a new concept for teaching, Exner Education, drawing on their 25 years of experience in the construction industry have tailored this course to address many of the challenges facing Construction Projects and their Project Managers today. In guiding a project – particularly one in the building and construction industry - an intricate knowledge of Project Quality Management is critical in determining the project’s outcome. 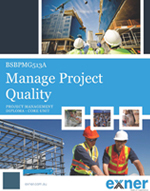 In reality, people practice many of the concepts involved in Project Quality Management however our course will allow students to fully utilise and benefit from such a detailed understanding of Project Management Diploma theory. 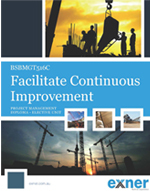 Whilst a Project Quality Management is not a new concept for teaching, Exner Education, drawing on their 25 years of experience in the construction industry have tailored this course to address many of the challenges facing Construction Projects and their Project Managers today. In guiding a project – particularly one in the building and construction industry - the way risks are identified and managed is very crucial to the successful delivery of the project. In reality, many people talk about managing risks in construction, but very few are really good a understanding the risks, quantifying them and determining how to mitigate them. 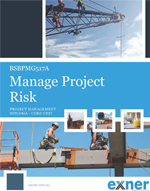 Whilst a Project Risk Management is not a new concept for teaching, Exner Education, drawing on their 25 years of experience in the construction industry have tailored this course to address many of the challenges (call them risks) facing Construction Projects and their Project Managers today. 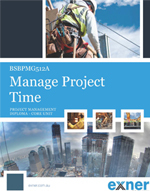 In guiding a project – particularly one in the building and construction industry - an intricate knowledge of Project Time Management is critical in determining the project’s outcome. In reality, people practice many of the concepts involved in Project Time Management however our course will allow students to fully utilise and benefit from such a detailed understanding of Project Management Diploma theory. Whilst a Project Time Management is not a new concept for teaching, Exner Education, drawing on their 25 years of experience in the construction industry have tailored this course to address many of the challenges facing Construction Projects and their Project Managers today.